My thoughts exactly. This piece by John Kelly was published by The Australian Independent Media earlier today, and is republished here with permission. Many thanks to John Kelly and Michael Taylor. The Victorian State Election has become a defining moment for the LNP, whether they like it or not. The burning question on most Liberal minds right now is what to do with the dear leader, Tony Abbott. On the one hand it is difficult to see the Liberals allowing Abbott to lead them to the next election. His propensity for appearing dysfunctional cannot be tolerated indefinitely. The odds that he will continue to embarrass his government in one way or another are very short. The likelihood he will change and assume statesman-like characteristics is a pipe dream. He is just so far out of his depth a submarine would struggle to find him. And, historically the Liberals have limited patience for those who become an impediment to the image they have of themselves; an image of ‘born to rule’, of continued, ongoing governance of the peasantry. They know that sooner or later Abbott is going to drop another clanger either domestically, or on the international stage. They also know the nation is, in effect, on 24 hour alert steeling itself as it waits for the next big blunder. The hope might be, within Liberal minds that as each blunder comes along we might start getting used to them and even become immune to them. On the other hand, if the Liberals leave him there, keep him out of harm’s way and try to create a troika around Bishop, Hockey and Turnbull, it won’t be long before confusion, contradiction and back bench dissatisfaction cause a parliamentary meltdown. Whatever they do, Abbott will remain an electoral liability so toxic, the majority know it will send them back into opposition after one term. But, by removing him they also paint themselves with the same brush they so savagely slapped over Labor when Julia Gillard replaced Kevin Rudd. The only difference is, we can all see Abbott’s dysfunctional nature. We would understand why he had to go and that might work in their favour. That small positive, however, is unlikely to work. The reason is that the options for a new leader are pretty ordinary. Whichever way they go, they are on a hiding to nothing. At the beginning of the year Hockey looked the goods but it wasn’t long before he started suffering from foot in mouth disease and then, of course, he delivered his first budget, which turned out to be a self-inflicted blight on his aspirations for future leadership. More recently, Julie Bishop has been seen as leadership material as she strutted the international stage, turning heads and getting pasted up in Harper’s Bazaar. However, we have not forgotten her foray as shadow treasurer at the beginning of the Rudd administration which saw her out of her depth too. As Foreign Affairs minister we only get to see her in ten second bites shaking hands with other world dignitaries. It is difficult to see her holding up to the close scrutiny of national leader if she couldn’t cut it as an alternative treasurer. One thing is for certain: she is no Julia Gillard and that, sadly for her, is the current benchmark. Which leaves us with the only other possibility, Malcolm Turnbull. While there are plenty in the party who would back him, there are more who simply won’t. It is questionable that he shares their ideology; many fear he might drag them, kicking and screaming, to the centre, away from Murdochism. That would leave them without a narrative. And therein lies their dilemma, made even more difficult as their ideological approach to government continues to hit brick walls in the Senate. Who would have thought twelve months ago that it would come to this ; the quickest act of political self-destruction in our history. And how deserving of it they are. 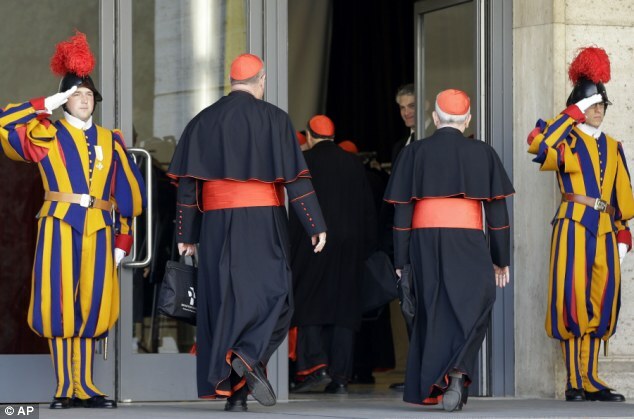 As I watched these pretenders parading themselves up and down the lower house chamber one day last week, I was reminded of the stench of arrogant superiority I witnessed in St. Peter’s Square in Rome some years ago watching the red hats of the Vatican do much the same thing. And that, it seems to me, is who these ideologically recalcitrant adolescents think they are. These pompous overlords of Neo-liberal macroeconomics, these Reaganists and Thatcherites, the ‘trickle down’ team of wealth distribution. Only in the Senate do they display themselves with any degree of humility and respect for the office they hold; a measure of their uncertainty and reliance on others beyond their control. So, I say, let them continue to self-destruct and display themselves as they really are to those who voted for them; not their loyal members, their ideological clones, but the swinging voters who were sucked in by their lies, their spin, their false promises. Let those who voted for them see what they got for their money. Let the 6-10 per cent of the electorate who decide elections squirm a little longer. Keep the dear leader in play for another two years as we watch the economy go headlong into recession and the false debt continue to grow. Whichever way they go, we can be sure self-preservation will trump national interest and that, ultimately, will be their undoing. Morrison may have ‘promised’ to get children out of detention by Christmas but he has never said where they will be sent if that happens. Cambodia perhaps? Settled in the community on Nauru or Manus Island, where they are not wanted? We have all seen reports on what is happening to teenagers moved into the community on Nauru. He never said which Christmas, either. In a couple of weeks, when no plane loads of smiling refugee kiddies arrive in Sydney or Melbourne we will be told we misheard, or there was no promise. Scrott only said he would try to get kids out of detention by Christmas 2020, and it’s all Labor’s fault they are still stuck in detention. Last night in the senate Sarah Hanson Young asked for clarification – she believed Clive Palmer had been told that family reunions would be allowed under the new legislation. She didn’t think that was right. Michaelia Cash kindly helped her out – family reunions were not included. So the wily SHY had gained an admission from the government that Palmer was fed lies. Michaelia Cash didn’t realise she had been fooled into that admission. Senator HANSON-YOUNG (South Australia) (21:45): I would like to ask the minister why it is that Clive Palmer was led to believe, according to his announcement today, that these amendments would cover family reunion. Could the minister please point to the amendment where family reunion is included? Poor Palmer was duped. He thought he was getting kids into Australia for lovely Christmas dinners. Instead they will undergo ‘fast-tracked’ processing which will either see them sent to some hell-hole third world country for ‘resettlement’ or denied refugee status and sent back to whatever danger they have already escaped. The supposed concessions negotiated by Palmer with Morrison were not included in the actual legislation. They are simply a verbal agreement. Palmer has been duped. When Morrison does not follow through with his undertakings will Palmer wake up or will he be proven to be full of bluster and an easy scalp for the for the scum. Happy birthday next week. As for the bottom of the bucket. I think you have underestimated just how deep the Coalition bucket is. Exactly. Just ‘promises’, and no details given, just vague assurances that things would be done. Any cross benchers who fell for Morrison’s lies should resign, right now, pleading incompetence. They won’t, of course. The government has promised Palmer something. Two days ago his support was in question, then yesterday morning it was locked in. I don’t think Palmer’s heart was simply melted by the thought of 460 kids having Christmas dinner in Aussie backyards. Get it while it’s hot. Not sure how long it’ll last until one of the busy-bum Wiki editors starts chowing-down on it. My Wikipedia contribution to the subject of “bootstrapping”. A media bootstrap is the process whereby a story or meme is deliberately (but artificially) produced by self and peer-referential journalism, originally within a tight circle of media content originators, often commencing with stories written within the same media organization. This story is then expanded into a general media “accepted wisdom” with the aim of having it accepted as self-evident “common knowledge” by the reading, listening and viewing publics. The key feature of a media bootstrap is that as little hard, verifiable, external evidence as possible is used to support the story, preference being given to the citation (often unattributed) of other media stories, i.e. “journalists interviewing journalists”. Because the campaign is usually originated and at least initially concocted internally by a media organization with a particular agenda in mind, within a closed loop of reportage and opinionation, the campaign is said to have “pulled itself up by its own bootstraps”. A bootstrap campaign should be distinguished from a genuine news story of genuine interest, such as a tsunami that kills thousands, or the death of a prominent public figure. There is a legitimate need for these stories to be given a blanket coverage across all media platforms. What distinguishes a bootstrap from a real story is the contrived and organized manner in which the bootstrapped story appears to come out of nowhere. A bootstrap commonly claims to be tapping a hitherto unrecognized phenomenon within society. As self-levitating by pulling on one’s bootstraps is regarded as physically impossible, this physical impossibility is often used by the bootstrappers themselves to deny the possibility that the bootstrap campaign is indeed concocted and artifical. Media campaigns that are declared to be such (e.g. “Let’s Clean Up Our City”) are usually ignored by other media organizations for reasons related to competition. On the other hand the true bootstrap welcomes the participation of other media organizations, as this participation gain the bootstrap notoriety and, most importantly, legitimacy. Journalist-A writes an op-ed on page 17 in “broadsheet” Newspaper-1 on a Monday, noting that a nation’s government has been spending a large amount of money on aged pensions, using a small number of examples. In Tuesday’s edition of the same newspaper, Journalist-B quotes his colleague Journalist-A’s article, adding extra examples of alleged spending, how this spending has blown out with an ageing population, and expanding the alleged high spending from aged pensions to unemployment benefits, claiming that much of this spending is “waste”. Later on in the Tuesday, the afternoon edition of a sister “tabloid” newspaper (i.e. part of the same media organization as Newspaper-1), sensationalizes the story from Newspaper-1, asserting it has proof that many social security recipients are defrauding the government by falsifying claims. Thus a moral dimension has been introduced at an early stage of the bootstrap, enabling media consumers to feel superior to those being revealed as immoral by the bootstrap on an “Us” (the majority) versus “Them” (the Minority) basis. It is immaterial whether the claimed minority under examination is in fact a minority. The essential aim is to give permission to the media consumer to believe they are part of the moral majority, whether this is in fact true or not. A successful bootstrap enables one section of society to sneer at another. On Wednesday morning a separate broadcast media organization, not related to the first, picks up the tabloid story, and quotes it as a short filler or headline piece, without closely examining the evidence it provides. This is a key point in the process, as the bootstrap has moved outside the originating media organization. That same morning, several journalists from Newspaper-1 quote the original stories in their own newspaper, the tabloid story about fraud, and the other organization’s broadcast story, now citing (generalized) “media reports”, in order to disguise the fact that the original source for the bootstrap was a single seed story in their own newspaper. Involving another media organization is a vital factor in any bootstrap’s success. Even the participation of other mastheads within the same organization is helpful, as most media consumers are not aware that these mastheads share a common ownership and editorial policy. In this latter case the phrase “newspapers all over the country” can now be used by commentators, referring to the same story being printed, sometimes word-for-word, in several mastheads owned by the same proprietor, pushing the same bootstrap campaign. At this point the bootstrap begins to take on a life of its own. The involvement of other media organizations, picking up the story from its original, single source is vital to a successful bootstrap campaign. After this has occurred, attribution as to source is not strictly essential. Factual journalism begins to give way to opinion pieces. Phrases like “media reports” and “in the media” may be used safely, as the salient feature becomes not the particulars of social security excess, but what people (i.e. journalists) think about it. Particularly successful bootstrap campaigns may make the claim that “the public demands” (or “rejects”) certain political results stemming from the bootstrap. A particularly powerful bootstrap does not cite scientific opinion polling, but may refer to “on-line” (i.e. un-scientific) polls employing self-selecting samples often from the other pages of the same newspaper, or may even rely simply upon the opinion of individual journalists to assert what is claimed to be “the public’s” view of the matter. By Thursday, headlines such as “Social Security Crisis” and “A Nation Crippled” start to appear. In the tabloids and morning TV talk shows, paparazzi-style photographs of supposedly disabled workers mowing their lawns, playing golf etc. with no sign of their claimed injuries, are published, along with “Dole Rip-Off” and “Green Stamp Gouge” headlines. Newspaper-1 produces an editorial, on page 1, demanding action by the government on “The Great Social Security Scam”. Tabloid pieces in other newspapers produce logically irrelevant, but dramatic figures to “prove” that there are currently more citizens “freeloading off the taxpayer” than there were of “our brave soldiers” killed fighting for the nation during the First and Second World Wars put together. By the morning of the Friday, Newspaper-1 introduces the notion of “a society living beyond its means” via several articles written by staff journalists, quoting – preferably without attribution – their colleagues (who often work from an adjoining office or cubicle in the same building), other newspapers and media organizations’ reports and op-eds along the same lines, widening the scope of the bootstrap to allegedly over-generous university student loans, taxpayer subsidized businesses (automobile manufacturing is a favourite), school textbook and uniforms grants, scientists “in on the Climate Change gravy train” in order to maintain “luxury lifestyles”, “junket travelling” and “bloated research budgets”, as well as artists who receive government financial help to produce decadent, anti-social artworks that sap the nation’s morals. The following Monday a senior government Minister “co-incidentally” announces laws enforcing a long-planned crackdown on Social Security payments, citing “article after article in the media” (cross-publicising the originating media organization and maintaining the tightness of the feedback loop), claiming the nation is being sent bankrupt subsidizing “leaners” who feel a “sense of entitlement” to “hard-earned taxpayers’ money” but who produce nothing in return. Talk-back radio by this time is abuzz with allegedly independent, working-class callers who have read the previous week’s newspaper articles or watched morning television shows, and who each have their own stories of waste, corruption and fraud to report. If Social Security abuse can be linked to a particular class of citizens (or better, non-citizens) then this can generate its own bootstrap campaign, vilifying anyone from “illegal immigrants” to “pampered leftist students”. Sure signs of success of the bootstrap campaign may include: pensioners phoning in to talk-back radio shock-jocks voluntarily demanding reductions in their own pensions and benefits; students and/or artists proclaiming that they have been successful due to hard work, do not need loans or subsidies, and that any subsidized student or artist only needs taxpayer money because they lack talent; tradesmen complaining about “lazy apprentices who’d rather be on unemployment relief than do a day’s work”; old soldiers returning their campaign medals, stating that they “didn’t fight for their country to see it ruined by hippies” etc. The key factor here is that public contributors in favour of the object of the bootstrap act and speak against their own interests in calling for the problem to be fixed. Media bootstraps may be applied to any subject material, including but not limited to (allegedly) excessively high corporate taxes; the evils of subsidized national broadcasters (often with ad hominem attacks on management and “corruption at the top”); national health schemes; “greenie tree-huggers” determined to stop industrial progress in favour of an obscure, but threatened species of wildlife; Climate Change and alternative energy industries; Gay Marriage; indigenous populations (with particular references to alleged endemic drunkenness, drug abuse and domestic violence); anti-alcohol and anti-gambling campaigns (referring to alcohol consumption and gambling as “part of our way of life”); political parties; “fat cat” public servants; and in particular other media organizations. Media bootstraps almost never refer to the question of whether the media itself has too much power and influence, except if the media organization targeted happens to be government subsidized. On rare occasions when media power is examined by a bootstrap it is invariably claimed that the particular self-examining media organization only reflects and responds to the preferences and opinions of its target audience, while others are clearly biased and misusing their influence. References to the denial of Freedom Of speech and/or Nazi Germany, North Korea or the Soviet Union etc. are often included. For a man who has managed to accumulate a fortune, Clive Palmer lacks the ability to discern when he’s being taken for a ride. He used his money and word flowers to get himself a Parliamentary seat yet is not dedicated enough to ensure his electorate is fully represented by putting his ample rearend upon his designated seat in Parliament each day when it is sitting. Why the hell voters in Fairfax ticked the PUP box is beyond my understanding. On a different matter – why the defence pay issue won’t be a vote loser for the government. Mining magnate Gina Rinehart close to finalising deal to buy more Kimberley cattle stations as she expands Western Australian beef empire. Ah, so that’s why the WA government closed down that 101 Aboriginal settlements. Opens up a heap of land for Gina and her mates to expand their cattle empires and multiply their wealth via the China & Korean FT Agreements. Everytime I see/hear Scott Ludlam the thought that he is sorely wasted as a Greens member crosses my mind. Why the frack do we need nuclear power with all the risks that come with it when we can use solar and wind power? Because when the arse falls out of fossil fuel power generation, Big Electricity will have to have some other way of guaranteeing their fat profits and their ability to tell us what we are to pay for their bloated efforts. In this context, green power doesn’t really cut it, as it is scalable, from rooftop to solar farm, whereas gigawatt power generation needs a lazy $20 billion to get off the ground, indeed to even start turning turbines. In addition, with a half-life of 24,000 years before it is safe, plutonium – in particular the operation and maintenance of nuclear waste dumps of plutonium – is a nice little earner, essentially forever. Nuclear waste management has an inexhaustable source of raw materials. I’m enjoying the karma that Hockey is going through right now. Remember when the media and Turnbull tried to make out Swanny didn’t know what he was doing? Hockey is in the process of it coming back to bite him on his bum. 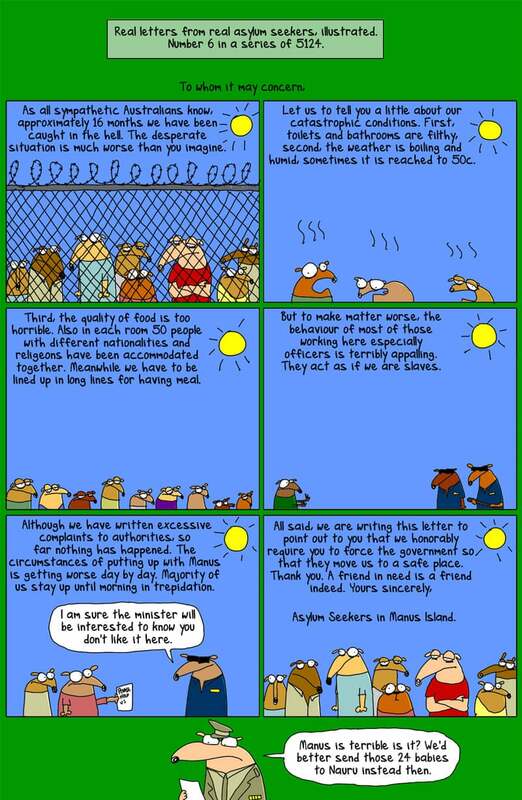 Outraged over the asylum seeker stuff. Can’t do anything until the next election. That just about goes for everything at the moment. I’ve been meaning to do that for ages. I thought media “bootstrapping” was an established term when I started using it 5 years ago, but it appears I coined it, as there was no Wikipedia entry for it. I am so glad you got around to enlightening Wikipedia ! Now it might be a good idea to tweet your entry around the social media world. Your bootstrapping description of the media world was eye opening. We become immersed in the entrails and fail to see the big picture unfolding. I will now look for examples and reflect differently. It was outstanding analysis of the system. More power to you. HoJo’s karma will come when history has him as Australia’s worst ever treasurer. Swanny got all the gongs (well deserved) which will be forever a spit in the eye for HoJo, who spent the whole of JG’s term telling voters he would produce a budget surplus in his first year and every year after that. Cop a load of this. You won’t be disappointed. Another instance of the Law Industry looking after its own! [ Crown prosecutor Margaret Cunneen has won a high-stakes legal bid to shut down a corruption inquiry into allegations she attempted to pervert the course of justice, in a devastating blow to the corruption watchdog. A majority of the NSW Court of Appeal on Friday upheld a challenge by Ms Cunneen SC to the Independent Commission Against Corruption’s powers to investigate her and to hold a public inquiry. Justices John Basten and Julie Ward ruled that the commission had no power to investigate the deputy senior Crown prosecutor, 55, her eldest son, Stephen Wyllie, and his girlfriend, Sophia Tilley. Sophia Tilley with Steven Wyllie, son of Crown prosecutor Margaret Cunneen. Chief Justice Tom Bathurst dissented from the majority and would have allowed the commission to continue its investigation into allegations that Ms Cunneen and Mr Wyllie told Ms Tilley to fake chest pains to avoid a police breath test at the scene of a car crash in May. The decision is a devastating blow to the commission, which may seek leave to appeal against the decision in the High Court. It’s not behind the pay wall! I would think September 2016 would be far too long for many of us to put up with Shrek as Treasurer. “Former” Senior ABC journalist Sarah Ferguson delivers a punchy opening speech at the Walkley awards for excellence in journalism in Sydney. Managing Director Mark Scott was incensed at her speech and advised Ms Ferguson that her “Shark Pool” decided to part company with her! Not true so far, but I bet Scott would have liked to have given her the bullet straight after the Walkley Awards ceremony! The Integrated Cargo System (‘ICS’) crashed an hour or so ago. So no freight is moving – both sea and air. Custom and AQIS staff trying to find someone who knows how it works. Ron Tandberg won a Walkley last night for this cartoon. Abbott may well not be around to make that call on Jovial Joe. The killing season is never far away in politics. If – and it’s a fair if – the 2PP vote shows a consistent four to six point lead at mid next year, just wait for Fairfax, Essential, Newscorp to run polls comparing Abbott,Bishop and Turnbull against Shorten as PPM. It will be the only game in town. And fun. The Gallery won’t let go. It will add to the instability meme and, as we know, can be self serving. While Embattled Defence Minister Johnston enjoys long lunches and 190 bottles of wine defence underlings are reduced to using newspaper as toilet paper. Well, someone has to pay for all those dinner bills. Tories never change when it comes to stupidity and finding savings in expediture. The Defence toilet paper restriction reminds me of the Menzies Govt issuing an order for all govt. departments to decrease their spending – there was no sewerage system at the time so the toilets were nightcart pans and some bright costsaving person came up with the following: that it had been noted that toilet pans were being changed on a daily basis whether the pans were full or not. Therefore, only full pans would be changed daily. The Dept Head sent a notice out to his Admin section to appoint someone to calibrate the pans daily and place a large “tick” on the toilet flap to indicate to the nightcart operator which pans needed changing. Needless to say there was a lot of gleeful memos going to and fro within the Department which culminated in a comedy strip in the form of a serious letter to Head Office to the effect that the particular savings measure would result in more expenditure because a ‘dip stick’ would have to be purchased and an extra officer employed to carry out the calibration. Re-usable stickers would also need to be purchased to place on the toilet flap doors to indicate which pans were to be changed by the nightcart operator…..Since there was no return order from Head Office, their silence was taken as permission to ignore the directive. Reading an obituary for Jeremy Thorpe I came across this. Couldn’t help but think it would also apply to young Chrissy Pyne.. The Friday evening post will be up as soon as I can find the cartoon of Tony trying to work out which of the Reset or Self-destruct buttons he should press. Janice’s story posted 2.45pm on the origins of Dipstick is worthy of a Golden Echidna! For anyone interested in not using google and all it’s tracking stuff This site is pretty good. I have been trialling it for a while and so far no probs.